American Forests magazine has maintained a list of the biggest trees of each species in America since 1940. It began as the "American Big Trees Report," was re-titled the "Social Register of Big Trees" in 1961, and in 1978 it became the "National Register of Big Trees" - a publication in which more than 750 champions are crowned each year. To see the most current edition, click here. The Big Tree Program is active throughout the U.S., and its message has been the same for over 70 years: regardless of size, all trees are champions of the environment. Its goal is to preserve and promote the iconic stature of our country's living monarchs (its remarkable trees) and to educate people about the key role that trees and forests play in sustaining a healthy environment. Joseph Butler, a U.N.F. Biology Professor and herpetologist, was a guest speaker at one of the Ixia chapter's recent meetings. He hoped to study snakes when he moved to Florida, but found that they were hard to pin down, so to speak. He turned his attention to Gopher Tortoises, which proved to be a much more reliable subject to study, as they live long lives (50 years +) and there are over 400 burrows on campus.The gopher tortoise is federally protected as a threatened species except in Florida, where it is listed as a Species of Special Concern by the Florida Fish and Wildlife Conservation Commission. Have you ever wondered what the heck a scrubby flatwoods is or what the difference is between a slough and a wet prairie? Well, wonder no more! 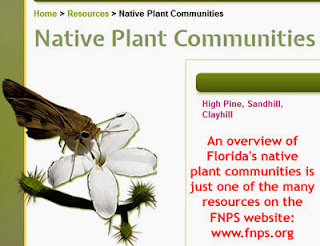 The FNPS website includes a Native Plant Communitiespage with all of Florida's complex ecosystems explained and illustrated by photos. The communities are organized into 13 broad categories: Xeric Uplands, Dry Mesic Uplands, Mesic Uplands, Wet Flatlands, Seepage Wetlands, Moving Water Wetlands, Floodplain Wetlands, Basin Wetlands, Rocklands, Coastal Uplands, Coastal Wetlands, Flowing Water Systems, and Lakes & Ponds. 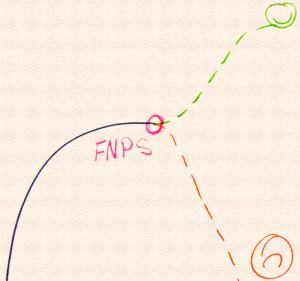 There are two or more specific communities under each broad category. Isn't Florida amazing?